So many amazing indie games are hitting the Switch eShop these days that it's getting hard to keep up with all of them. 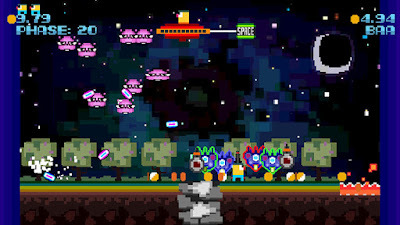 A relevant case in point: although I adored Woah Dave!--a frantic, Mario Bros.-esque platformer released for 3DS, PC, PS4, Vita, and Wii U back in 2014 and 2015--I totally blanked on its spiritual successor, Space Dave!, until right before it hit the Switch eShop late last week. Oh, well, all that matters now is it pinged my radar just in time. And, boy, am I glad it did, as I've become thoroughly smitten with Space Dave! in the four-plus hours I've spent with it thus far. Don't worry, I'll share some impressions of the game in the next week or so. Today, though, I'm sharing the contents of a little tête-à-tête I recently had with its creator, Jason Cirillo. Before we get to that, I need to make something clear: although proper references to both Woah Dave! and Space Dave! end in exclamation points, I'm going to remove them from here on out in an attempt to make this post as readable as possible. The Gay Gamer: After the success of Woah Dave, I’m sure a lot of people felt, as I did, that you’d follow it up with a direct sequel. What made you go off in a different direction and make a game inspired by the fixed-shooter genre instead? Jason Cirillo: The initial idea was that these games would all be arcade homages brought into the modern era. Woah Dave, for example, pulls systems from some of my favorites like Mario Bros., Bubble Bobble, and Space Panic. I wanted to do another homage-style game that pulled from an entirely different set of games. That's kind of how Space Dave was born. Some of the inspirations, like Galaga and Space Invaders, are fairly obvious, while some others, like Gaplus and Missile Command, might not be. There might be more games in this series that are totally different genres as well, who knows. There might also be a direct sequel to Woah Dave yet to come. It would have Woah Dave in the title. 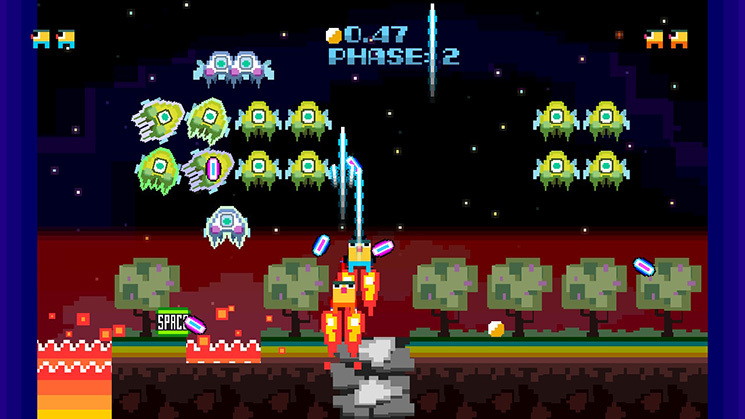 The Gay Gamer: Did any more modern games serve as Space Dave’s inspiration? Jason Cirillo: I'm not sure there's a specific title, though the more modern tower defense genre has crept in there quite a bit. Japanese bullet-hell shooters also were inspiring, though I don't do much of the fancy bullet patterns like they do. The Gay Gamer: Do you think someone has to be a fan of old, fixed-shooter games like Space Invaders to enjoy Space Dave? Or, what are the aspects of Space Dave that you feel will or could appeal to people who maybe have never even heard of Space Invaders? Jason Cirillo: I think it helps to be a fan, though I don't think it's necessary. I playtested the game with lots of people who aren't necessarily big retro game players, and they enjoyed it a lot. 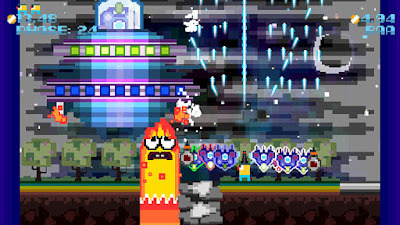 Lots of them like Space Dave better than Woah Dave. I don't think you'd have had to have heard of Space Invaders to enjoy it. Not to be cheeky, but in 1975, the entire world hadn't heard of Space Invaders. That proved to not be a problem for its eventual release! The Gay Gamer: Which aspects of Space Dave did you create, and which aspects did other people create? Jason Cirillo: I am the creator and director of the game, and I coded the original prototype of the game. I also did the music, sound, and graphics. When we went to console, we brought in a programmer familiar with the environment necessary to port it to work on Nintendo Switch. Our programmer, Garrett Varrin, is known for his work on Shütshimi as well, and he not only coded the Switch version, but he also lent a lot of great ideas to the game itself and really added a lot to the fun factor. The game definitely would not exist without his fantastic work on it. The Gay Gamer: Did you encounter any particular challenges while planning, designing, or developing Space Dave? If so, what were they and how did you overcome them? Jason Cirillo: The big problem was just trying to not be a straight-up Space Invaders or Galaga clone. I wanted it to clearly and unapologetically be inspired, like Woah Dave was, but I wanted it to be new. Making it feel new was the challenge. But I enjoyed that challenge a lot. I tried to overcome it by going back to what made Woah Dave work. I looked for opportunities where strategies could be developed and implemented. Putting in new gameplay elements that players could learn to use to their advantage was one way, like having the ground you walk on be a volatile element was a big part of that. Making stronger enemies that can more easily kill you become stronger allies to work for you was interesting, too. There's a fair amount of risk and reward in the game that makes it feel fresh. The Gay Gamer: What are you proudest of when you look at and play the finished product? Jason Cirillo: I'm proud that I made a game that I liked and that I wanted to play and stuck by that as my mission. Really, that's the only way I know how to make games. I'm always proud of finishing a project and seeing it in the hands of people who are having fun with it. That's always a really good feeling. 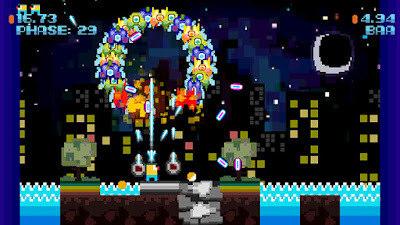 The Gay Gamer: I know Space Dave just came out, but how is it selling so far? Is it matching your expectations, exceeding them, not meeting them--or maybe something else entirely? Jason Cirillo: It's doing way better than we expected, to be honest. Woah Dave also did really well--frankly, also better than we expected--so I think I expected there would be a little cultish following for Space Dave. Still, I'm blown away with how well it's actually done so far. The Gay Gamer: Do you have any plans to port Space Dave to other systems at this point, such as PS4 or 3DS? Jason Cirillo: No solid plans for other consoles at the moment, but I am very open to it. We're probably bringing it to Steam. The Gay Gamer: How about Woah Dave? 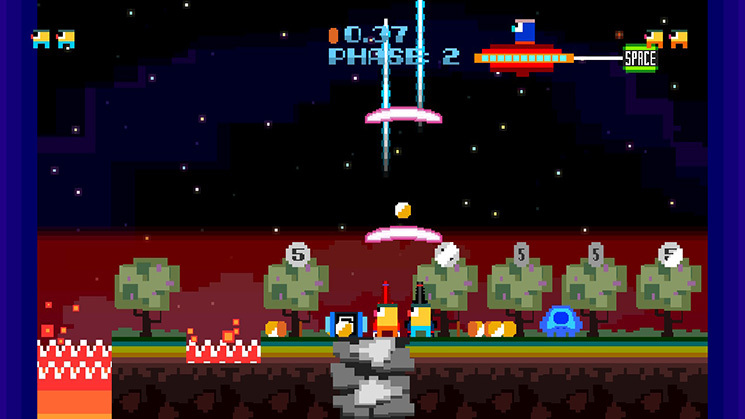 Is there any chance it’ll follow Space Dave onto Switch sometime soon? Jason Cirillo: When we get a lot of demand, we listen. And we have gotten a lot of requests for Woah Dave on Switch. So, there's a really good chance. The Gay Gamer: You recently asked people on Twitter which other genres they’d like you to explore in future Dave games. Did that help you at all? And did you already have an idea as to which other genres you’d like to tackle before you sent out that tweet? Jason Cirillo: Yes, the responses I got from that question on Twitter did help. Some really fun ideas there for sure. I have a few old arcade games I'd like to pull from in another Dave game, though I'm not sure I am ready to spill the beans just yet on that. I'd love to just go berzerk in the third installment and have a lot of fun with it.